Boiler Timer Not Working Correctly? Here’s Why. No Problem! You can get Gas Safe boiler engineers to help you fix the problem here. One of the biggest boiler problems we come across relates to the boiler timer not working correctly. In many cases, it can look like it is another part of the heating system that is not working. These clocks do tend to develop faults after a few years. They either stop working altogether, or act intermittently, such as randomly turning themselves off. On the flip side. It’s important to diagnose a fault boiler timer correctly. We’ve gone to emergencies before where a new clock was fitted by another installer, but that wasn’t the problem. That’s a lot of wasted cash, and one very unhappy person. We’re going into detail here, but for the price, sometimes it’s just easier to get a new boiler timer. 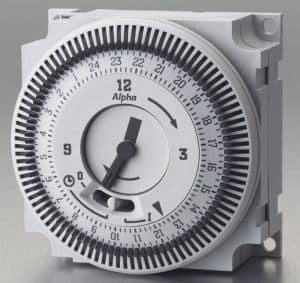 If you need someone to help fix or replace a boiler timer, you can get quotes here. Thinking about upgrading your boiler? You can get prices from £1,795 here, including up to £200 of smart heating controls! If you are running a combi boiler, the second you turn on a hot tap, shower or heating, the boiler should begin giving warm-hot water. To help determine if it is the clock that’s playing up, see if you recognise any of the following symptoms. If you do, there’s a good chance it’s the boiler timer that is at fault. The room thermostat is not connecting with the timer, and not telling the boiler to turn on. First, check the time on the boiler is correct. If the clocks have changed (or you have had a recent power outage), there’s a good chance the time is incorrect. This can also be the case if you’ve have any recent electrical works carried out in the home, where the electrician has had to move relevant wiring. Many boilers will automatically reset the clock to midnight. This could explain any intermittent problems you are having with the boiler (i.e. it comes on at random times). Next, check there is power to the boiler. If your boiler is not working altogether, there’s a good chance there’s a fuse gone in the switched spur. Changing a fuse could solve the problem. If you do have power, any intermittent problems could be caused from dodgy wiring. It’s advisable not to mess with any electrics. Either get an electrician or a Gas Safe engineer to come and check this for you. There’s a good chance it’s the thermostat that’s the issue here, and not the timer. Timers tend to be built in a slightly more robust manner than the thermostats. The main reason for this is because they are built into the boiler, and quite hard to replace. Your room thermostat will monitor the temperature of the room. When the temperature drops below your desired temperature, it should kick the boiler into action. If there’s a fault with the thermostat, it might not communicate with the boiler, or tell it to come on. Another potential problem, is the location of the thermostat. If the thermostat is too close to a heat source (radiator), it will think the room is hotter than it is, and turn off. If the room thermostat is too close to a draught, it will think the room is much colder than it is, and turn on. If you’ve noticed that your house is a lot colder or hotter than it should be and you’ve a thermostat moved to a new location, it could be that location that is causing all the issues. If these considerations are considered when installing a thermostat, it’s going to work much better. This is a pretty obvious one, but make sure you have not turned down the heating instead of the hot water (or vice versa). Even if you haven’t, there’s a good chance someone else in the house might have done. We’ve been to more than one property in the past where this was the case. A lot of boilers and mechanical timers will have a reset switch. You can try resetting the timer to solve the problem. Bear in mind, after a reset many boilers will revert to 12-midnight. So, make sure you use the manual and change the time. Otherwise, your boiler is going to be coming on at extremely random times! Call a professional to come and help you fix the problem. There are a tonne of repair engineers that can help you here. Or, if you expect to replace your timer and have an old boiler, it might be worth considering a replacement. You can get quotes from £1,795 including up to £199.99 worth of smart heating controls. Manufacturers such as Baxi, Ideal Boilers and Worcester, all offer replacement parts at a pretty reasonable cost. If your boiler isn’t over 10 years old, replacing the mechanical timer is going to be the most cost effective option. Whoever you use, make sure they complete a full diagnostic first. It’s not good replacing the boiler timer, and even the thermostat, to find that neither of the installations fix the problem!